Founded by Catherine the Great, the maritime city of Sevastopol has been fought over for centuries. Crucial battles of the Crimean War were fought on the hills surrounding the city, and the memory of this stalwart defense inspired those who fruitlessly battled the Germans during World War II. Twice the city has faced complete obliteration, yet twice it has risen, phoenix-like, from the ashes. 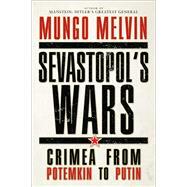 In this groundbreaking volume, award-winning author Mungo Melvin explores how Sevastopol became the crucible of conflict over three major engagements--the Crimean War, the Russian Civil War, and World War II--witnessing the death and destruction of countless armies, yet creating the indomitable "spirit of Sevastopol." By weaving together first-hand interviews, detailed operational reports and battle analysis, Melvin manages to create a rich tapestry of history. General Mungo Melvin CB OBE is a retired senior Army Officer. In the Royal Engineers, he saw operational service in Northern Ireland, the Middle East, and the Balkans. He specialized in strategic analysis, professional military education, and doctrine. He is president of the British Commission for Military History a senior associate fellow of the Royal United Services Institute, and a senior visiting research fellow of the war studies department of King's College London. - Origins of the conflict; Allied (British-French-Turkish) and Russian war aims. - Battles of Alma, Balaklava and Inkerman; impact on Russian planning. - Life for the besieged in Sevastopol. - The siege intensifies; June and September Allied assaults. - Decisive French capture of the Malakhov; Russian evacuation across bridge of ships. - Ceasefire and conclusion of the Crimean War. - All underpinned by personal accounts of participants such as Eduard Todleben, Leo Tolstoy and Charles Gordon, and many others, British, French and Russian, but giving more emphasis to the latter and also to the French. English accounts are already very well documented elsewhere, but new material will be presented. - Aftermath of the Crimean War; reconstruction; Gordon returns. - Rebirth of the Black Sea Fleet; rebuilding and extension of defences. - Russian revolution of 1905: Potemkin and Schmidt mutinies. Armed rebellion in the city. - Goeben shelling of Sevastopol, October 1914. Russia declares war against Turkey. - Role of Sevastopol during the First World War; German occupation. - A very under-researched area; very little published in English. Lots of detail already uncovered in Sevastopol state archives from contemporary newspaper reports etc. - After the Russian Civil War; impact of Soviet policies on Sevastopol; new defences. - Lead-up to the Second World War; German invasion – Operation Barbarossa. - Prequel in Odessa – German-Romanian Siege and Soviet Evacuation. - German invasion of the Crimea (September-October 1941). - Soviet Preparations (from June 1941). - Soviet Organisation of Sevastopol Defence Region (as at November 1941) under Admiral Oktyabrskiy; integration of the Coastal Army under General Petrov. - Personal accounts to describe what members of the city's garrison and people thought and felt at the time. Many interviews of veterans already completed. - German capture of Simferopol, capital of the Crimea. - First defence of Sevastopol. - Soviet reinforcements and counter-attacks. - German preparations and failed offensive, December 1941. - Main focus of winter campaign switches to Kerch peninsula. - Soviet reinforcements of Sevastopol by air and sea; role of the partisans. - German thin ring round city holds; declining German morale; Soviet harassing attacks. - Life in the city; role of the civilian population and workforce; communists and commissars. - Context of Crimea and Sevastopol in second year of German-Soviet war. - Soviet intelligence, planning and preparations. - Ferocious air and artillery bombardment. - Various German, Romanian and Soviet accounts. - Costly German and Romanian attacks. - Cracks in the Soviet defences appear. - Manstein's plan for the final attack on the city. - Last-ditch Soviet actions to defend the city. - Capture of the city; Manstein promoted to Field Marshal. - Break-down of Soviet command and control; mixed scenes of bravery and chaos. - Soviet evacuation of the Chersones Peninsula. - German war crimes; Soviet partisans; role of the Tatars. - Soviet victories at Stalingrad and Kursk, liberation of East Ukraine and Kiev; winter offensive. - German forces (Seventeenth Army) cut off in the Crimea. - Soviet planning for liberation. - Soviet assault of the Sapun Gora. - Liberation of Sevastopol; description of devastation. - Sevastopol during the Yalta Conference; Alanbrooke's visit; Churchill's stay. Mrs Churchill's visit. - Recognition as Hero City; priority for reconstruction; work of German prisoners-of war and Soviet labour gangs. - Industrialisation and technology; academic and military research. - Enduring military significance; growth of the Black Sea Fleet. - Role in the Cold War. - The end of the Soviet Union; Gorbachev and Sevastopol.